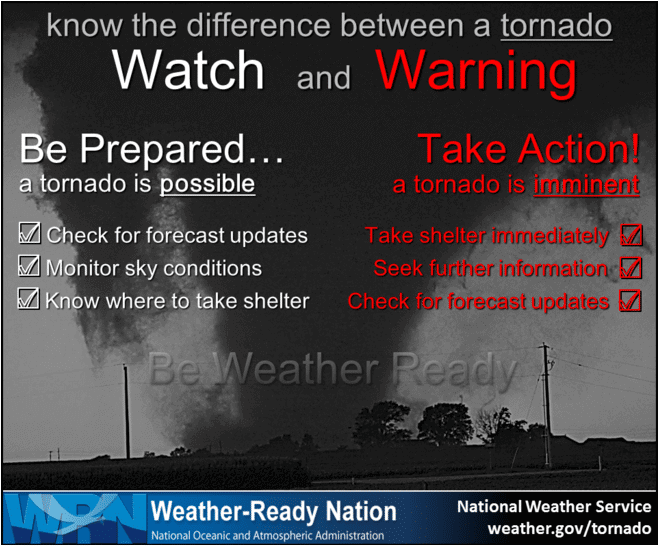 ﻿ What Is the Difference Between a Tornado Watch and a Tornado Warning? Was a tornado watch or tornado warning just issued for your area? Is it time to take action? Do you need to take cover? We have all the information you need right here, including what you need to do to protect your family's life and your property. A tornado watch is issued when conditions are favorable for a tornado to occur in and near the watch area. Watches are issued by the N﻿﻿﻿WS﻿ Storm Prediction Center when severe thunderstorms capable of producing tornadoes are possible. At this point, a tornado has not been spotted on the ground or indicated on radar, but it's important to stay tuned to local news and weather sources for the latest information as conditions can change quickly. Review your family's emergency plan, make sure your emergency preparedness kit is packed and know where to take shelter. Tornado watches are typically issued hours in advance and may be in effect for several hours as long as conditions are favorable for tornadoes to occur. 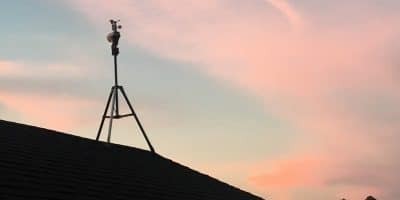 Have a source of reliable information close by that can relay messages from the National Weather Service. If you have a smartphone, it is a good idea to check the radar and forecast regularly. This is especially true if you notice weather conditions changing quickly, or thunderstorm clouds in the distance. If you have an NOAA weather radio, make sure it’s turned on, fully charged and capable of receiving alerts. Watch the skies for changing weather conditions. Don’t just depend on your smartphone app—use your eyes and ears. Watch nearby clouds. If you see thunderstorms developing in the distance, or distant lightning, act as quickly as possible to take cover to protect yourself. 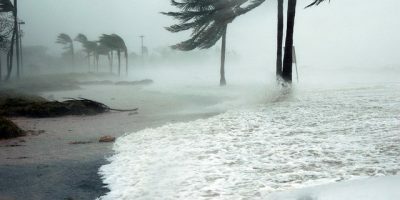 Signs that a tornado may be nearby could come in the form of dark-greenish or orange-grey skies, low lying and rotating clouds, and a noise similar to a freight train, but there could also be very little warning at all. Review your emergency plan. If you have a severe weather disaster kit, make sure you have everything you need in the event a tornado does occur. Ensure your "safe space" is clear of any projectiles and easily and quickly accessible. Make a note of a safe place to shelter. If you’re at home, you should already have a safe spot where you can go inside your house such as a basement, storm cellar or an interior room on the lowest floor with no windows. If you’re not at home, make sure you know where the closest designated public storm shelter is located. If a tornado warning is issued for your area, take immediate shelter in a safe, sturdy building, as a tornado is either occurring or is imminent. A warning has been issued because a tornado has either been sighted by an eyewitness or picked up on Doppler radar. In many cases, you may have a matter of minutes, and sometimes just seconds to take action. It's important to be prepared beforehand. Take shelter indoors immediately. Go to your safe spot in your house in an interior room on the lowest level away from any windows and doors and don't forget your pets if time allows. Don't stay in a mobile home, find shelter in a sturdy building. Listen to a battery-powered radio. Listen to local radio or your NOAA weather radio for updates. Do not depend on your cell phone as the service may cut out when the tornado passes through. Keep all windows and doors closed. DO NOT open them—this is a myth. Having open windows and doors have actually been shown to enhance damage rather than prevent it and you will waste valuable time in getting to your storm shelter location. Closed windows and doors also provide added protection from projectiles in the wind outside. If you're in a vehicle drive straight to the closest sturdy building. Tornadoes move unpredictably and being in a vehicle during a tornado is not safe. DON'T try and outrun the tornado. If you are unable to make it to a safe shelter, park your car, fasten your seat belt, get your head down below the windows and cover your head with your arms and a blanket or other cushion if possible. If you can safely get noticeably lower than the roadway (i.e., lying in a ditch or ravine), get out of your car, lay down and cover and protect your head with your hands. DO NOT hide under a bridge or overpass. Winds and debris are actually worse under these structures. Wait for the all clear signal. Do not leave your safe space until you receive notice that the warning has ended and the tornado has passed. 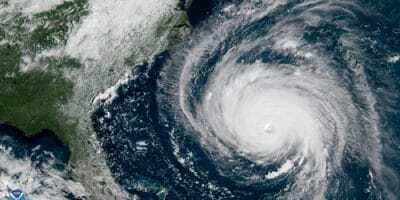 What’s the Difference Between a Hurricane, Tropical Storm and Tropical Depression?